For a great many years, there has been an alternation of booms and slumps. During a boom, people and businesses are tempted into excessive borrowing. During a slump, there is the misery of unemployment for millions of people and the misery of business ruin for tens of thousands. We will argue in this Paper that the boom-slump cycle can be largely, and perhaps entirely, averted. Consider the slump which began in 2008. In Britain, in the United States and even more so in Ireland, the first sign that anything was wrong which the ordinary person noticed was a drop in house prices. But what we call a “house” is really two very different things. There is the building, and there is the land on which the building rests. The price of building a house on a vacant site didn’t change very much. What did change was the price of the land underneath it. What was happening to house prices was also happening to the prices of everything else which rested on land – factories, offices, shops, farms and so on. During the boom which preceded the slump, there had been a rising demand for all kinds of goods. For most things, the supply was increased by more production in order to meet this demand, There was a call for more investment, there were more jobs. People also wanted more land for industry, more land for housing. But there was no way of increasing the supply of land. What happened was that the price of land shot up. Eventually, people could no longer afford that land. Prices wobbled, and then fell. Production fell as well. A slump had begun. Most people had got it wrong, “experts” as well as others. Many bankers and building societies, who had lent money on inadequate security, burnt their fingers badly. Governments had encouraged them to do it, and Oppositions had not warned them to act differently. At a lower level, estate agents faced a sudden drop in business and were sometimes ruined. Very few economists or journalists shouted warnings in time. All these “experts” were tacitly assuming that the boom would go on for ever. Consider what will happen if the present pattern continues. Slump or no slump, discoveries and inventions will continue to be made, and form the basis of eventual recovery. In the end, some people will find that land prices have fallen enough for them to afford it, and the economy will gradually pick up. Jobs will be created, and people who had been unemployed will receive wages. Demand for goods and services will recover, and boom conditions return. Whereupon, of course, the cycle will continue until eventually land prices get too high, and another slump will follow. The early economists got it right, where nearly everybody today has got it wrong. They saw the fundamental difference between “land” – a word which they used to mean more or less the same as “natural resources” – and everything else. They recognised that because the supply of land cannot be increased to meet demand, it will behave very differently in economics from things whose supply can be increased almost indefinitely. This analysis carries a vital message for today. 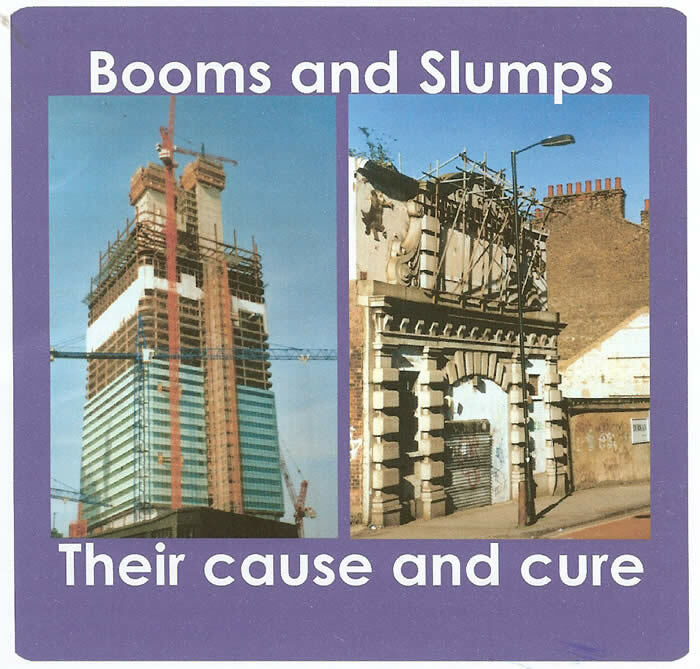 The way to overcome the boom-slump cycle is to treat land differently from other things. We propose what is known as Land Value Taxation (LVT). All land – housing land, commercial land, agricultural land and so on – should first be valued. That valuation should exclude the value of buildings, crops, machinery or anything else which has been put on it by human agency. A tax should then be levied, based on that valuation. That tax would gradually be increased, while other taxes, such as income tax or VAT, would be reduced. Like any other tax, LVT would need to be reviewed periodically – at least once a year. As boom conditions begin to develop, and land prices are beginning to rise, LVT will also rise, and will control the boom. If a recession begins to appear, LVT will fall, and money will return into the economy and avert a slump. Thus LVT would provide an automatic control, and get rid of the boom-slump cycle. But the time to introduce LVT is now. Once a slump is on its way, it will be too late. In other Topic Papers in this series, we show many other benefits which would follow from LVT.